A big surprise in a little Valley. Starting from the Swiftcurrent Motor Inn, you head west. Do not take the trail to Iceberg Lake, keep going west. Soon you will cross a bridge over a small creek as you make your way into the more foresty area that you will come in and out of until you get to the west side of Red Rock Lake. This is also the route up to Swiftcurrent Pass and over to the Chalet, Highline Trail or northern Highline Trail. There is a signed detour (200 yards or so) you can take down to Fishercap Lake at about .8 miles which is well worth your trouble. The lake has that beautiful glacial turqoise blue color and many times you will get the chance to see moose feeding in the lake and or area. You also have views Grinnell Point and of the north side of Mount Grinnell. Once back up to the trail you continue your way west through some groves of aspen and lodgepole pines. You will also cross a couple small streams as well as pass some rock outcroppings. If you're lucky you'll get to see some beargrass and if you look up and toward the right toward Mt Wilbur, a waterfall coming down a crevice. There is an un-marked route that ventures off from here called the Shangri-La. It is off-trail hiking though as there isn't a trail. While you're hiking you will see Grinnell Mountain towering over you to the left (south), Mount Wilbur slightly to your right and Swiftcurrent Mountain in front of you (the one with the lookout tower you can barely make out). Soon you will get a great visual of Red Rock Lake (and yes, it's fishable). There is an opening for you to get down to the water's edge and from there you can also look to the southwest and see the waterfall (Red Rock Falls) as it cascades down into the lake. From here you just head west a little further until you start bending to the left (south) around the top of the lake toward the Falls. 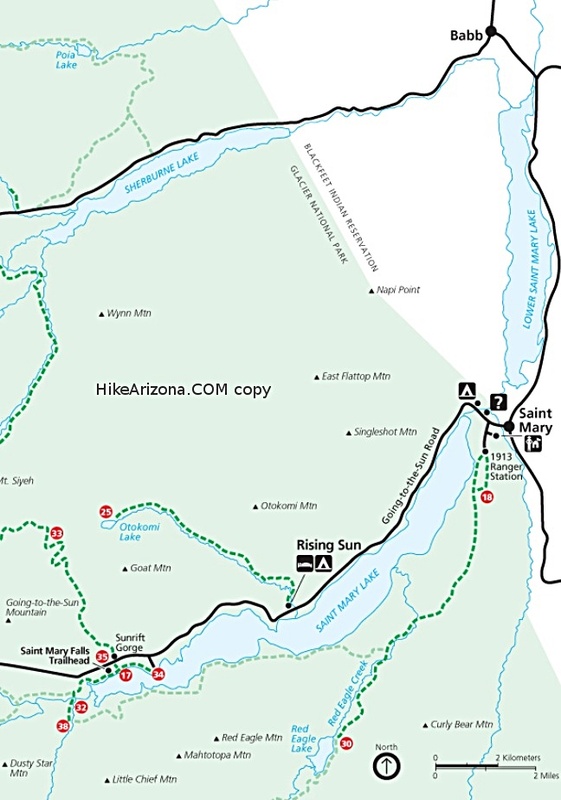 Once you get to the Falls intersection, you have the option of going to the lower side of the Falls or up the trail to do some exploring of the upper Falls area. The Falls are from Swiftcurrent Creek. 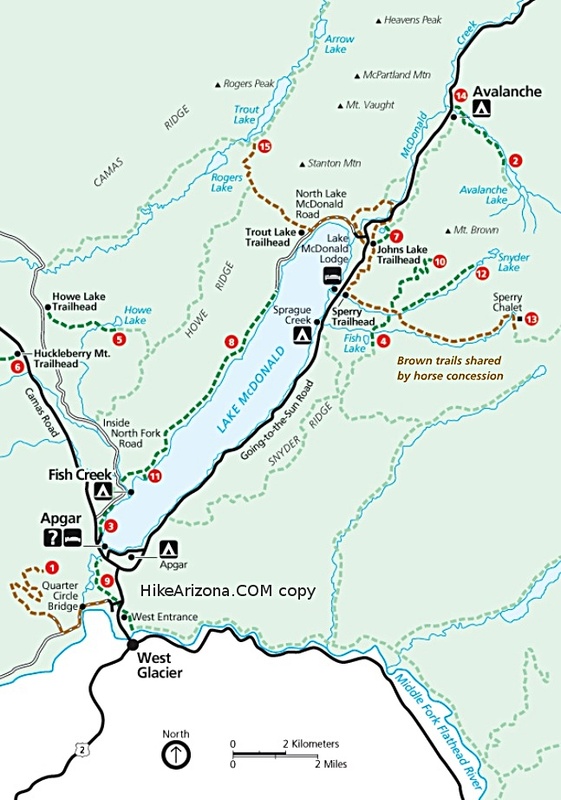 If you were to continue on this trail, you will eventually run into another lake called Bullhead and even further Windmaker (though I don't know if there is a trail to it). If you're hanging out at the Falls and looking at them as they fall into the lake, you will see Mount Henkel in the distance toward the NE (it has the red rock hue to it on its east and southern face. This is also the peak directly above Swiftcurrent Motor Inn where you started). 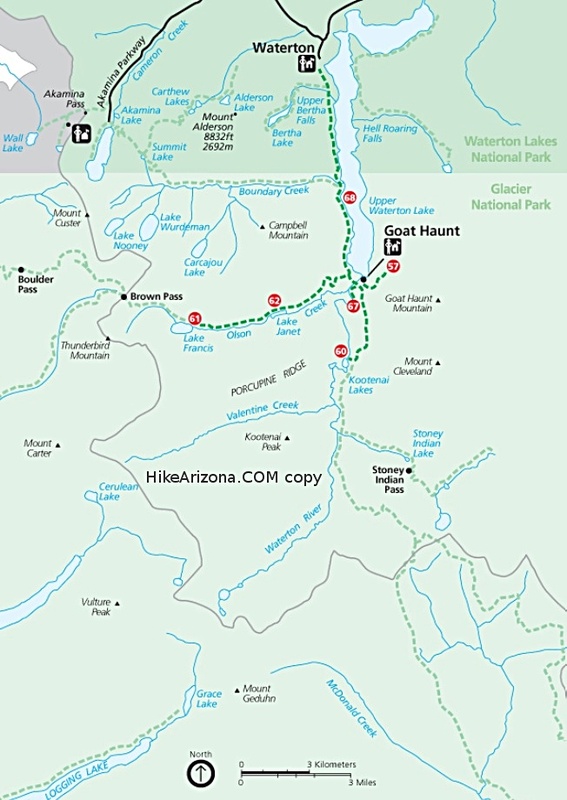 If you want to be more adventuresome, there is a bit of a trail at the bottom of the Falls where you can walk northward to a point of land where you have the lake on both sides of you. You will have to duck and squirm a little as the trail is somewhat overgrown. This can be a busy trail at times but this is a good thing so that the bears will keep their distance. It's also so nice to see smiling faces young and old. And like all trails in Glacier Park, be BEAR aware. 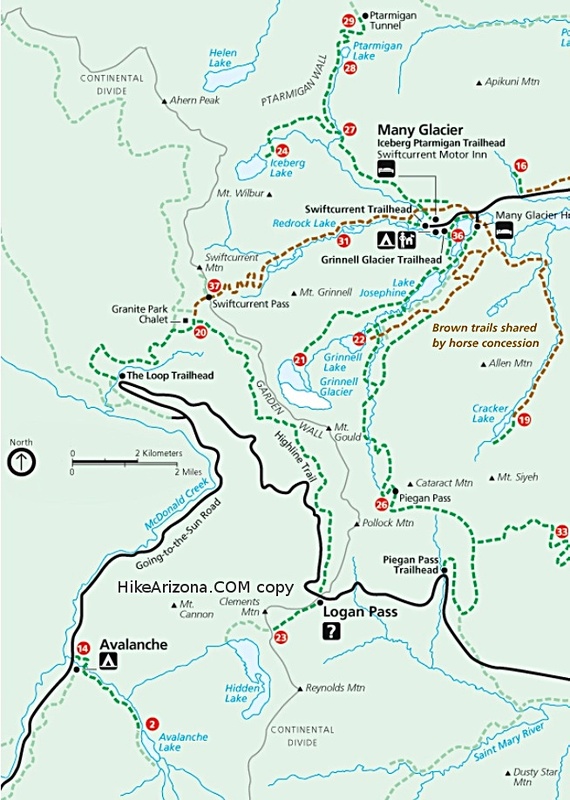 You will be heading for Many Glacier. From Babb, proceed west (toward the mountains) approximately 12.8 miles into Glacier National Park (you will pass the Many Glacier Hotel turnoff). You will see signage and the Swiftcurrent Motor inn will be on your right. 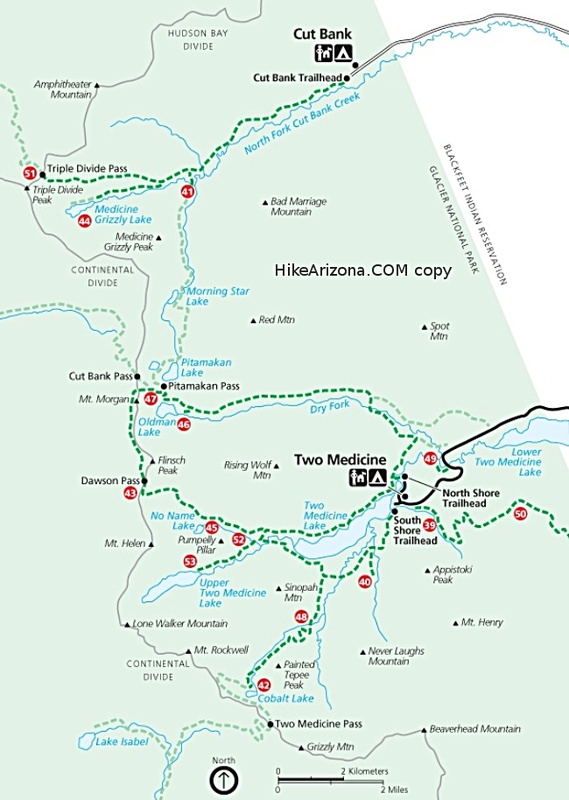 You can take either TH (next to the motel or west of the parking lot) but remember to keep heading west or you'll end up going on the Iceberg/Ptarmigan trail.